While Elena was tiptoeing around her boyfriend’s apartment, wiping shards of mini candy canes off her feet, I was in my bed a few blocks further uptown still recovering from what will go down in history as The Coldest Night of my Life. Cabs have been increasingly difficult to find the over past week or so in NY, and while I usually don’t mind a brisk walk home, I was not entertained by the lack of cabs on Saturday night at 2am on Avenue B. I’ll admit that the walk home only took me about 15 minutes, and that I was wearing (actually, clinging to) my knee-length puffy jacket. But no amount of down feathers could have prepared me for the bitter temperature and roaring wind in the East Village the weekend before Christmas. I guess I should’ve been better prepared (hat, scarf, gloves…pants? ), I mean, I have lived my entire life- other than a 4-year-stint in DC- in New York. But alas I was not, and I scurried my freezing self home at a much faster pace than I ran the Jingle Bell Jog a few weeks ago. 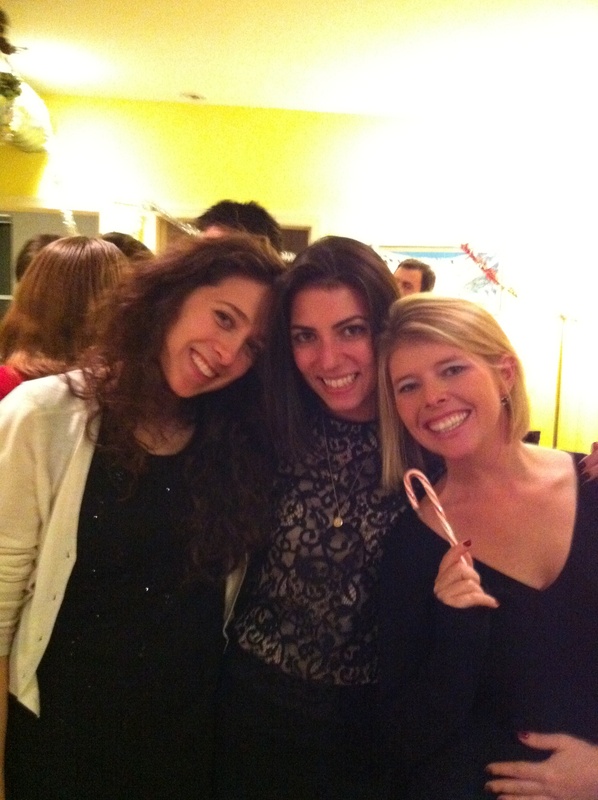 Enjoying the party at Elena's boyfriend's apartment before freezing to death. Katie is looking very festive with that candy cane! By the time I woke up on Sunday morning I was still cold. My bones were cold, even though I was wrapped in a blanket that Kourtney Kardashian once said was the best blanket in the whole world. Thanks for nothing, Kourt. Since Kourtney’s blanket was utterly unhelpful, the only thing I could think of that might warm me up was hot chocolate: Swiss Miss Sensible Sweets hot chocolate, to be specific. 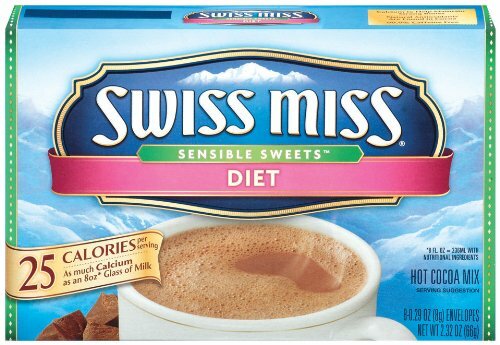 Swiss Miss Sensible Sweets looks and tastes exactly like their non-diet variety of the same product (at least I think it does– it’s been more than a decade since I’ve tried the original Swiss Miss so you might not want to take my word on that), but contains only 25 calories per powdery pouch. Just like regular Swiss Miss, adding boiling water or hot milk to the powder will give you a delicious warm cup of hot chocolate. Of course making it with milk adds a few calories, but even with a cup of skim milk (90 cals) you can still have a delicious and creamy mug of hot chocolate for under 130 calories! I didn’t end up leaving to buy Swiss Miss Sensible Sweets until later in the day, when I had already warmed myself up with a combination of large sweatshirts and a bowl of very old butternut squash soup that I had lying around my apartment. But Swiss Miss Sensible Sweets is certainly a more, um, sensible way to ward off the winter cold! ‘Twas 8 am Sunday morning, when all through my boyfriend’s apartment, not a roommate was stirring, not even the unidentifiable guy sleeping on the couch. Their big “Christmukkah” party had been the night before, and after a night of eating, drinking, dancing, crying a little, and then dancing more, I woke up needing a glass of water almost as much as I need this snood (hint hint, Mom…oh who am I kidding, she’s not reading). As I tiptoed into the living room, I surveyed the wreckage. Lots of empty beer cans, half-eaten cookies, a small pile of nuts on the floor…not too bad, I thought, as I cautiously made my way to the sink. My own room has looked worse, often after a trying-on-everything-I-own-while-wailing-that-I-hate-it-all rampage. It seems that I wasn’t quite cautious enough, because all of a sudden I felt some sort of sticky rod-shaped object beneath my (previously) clean, festively-red-toenailed foot. I gingerly lifted up my foot to see what it was: a lone, half-crushed mini candy cane–the poor little guy! Must’ve been in the wrong place in the wrong time. Welcome to my life, I wanted to tell it. I managed to clean off my foot, obtain my water (Mother Nature’s SkinnyDrink), and sneak back into bed without being completely traumatized. The whole incident, while unfortunate, ended up serving a very useful purpose in reminding me 1) always to wear socks in my boyfriend’s apartment, and 2) about one of the season’s best SkinnySnacks–mini candy canes. Mini candy canes = mini you! 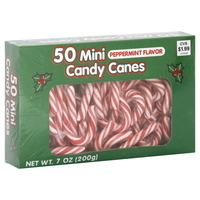 There is literally NO downside to mini candy canes, they are like manna from Santa. 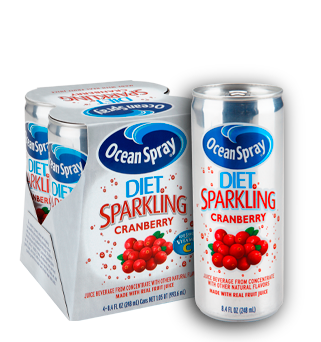 THREE of them are about 40-50 calories. They are festive, minty sweet, and take a long time to eat. You can even lick one until the end gets all pointy and then use it to threaten an irritating coworker. Holding one will add a charming sense of holiday spirit to your appearance, so you can flaunt one in front of that cute new guy. They are cute and striped and will make your breath smell better after all that garlic hummus. And if none of those reasons are enough, even my homie Snoop likes them. Enough said. Epilogue: Later, I went into the kitchen and scanned the room for other, whole, wrapped mini candy canes that I was maybe or maybe not planning on stealing for the office. Alas, none were to be found. What else could I do but take an unopened bottle of wine instead? Last night after work, Elena and I had a SkinnyOffice dinner party. I shouldn’t really call it a dinner party since it was just me and Elena sitting on the floor of my apartment eating sushi, but this time of year everything is more festive, and with my Christmas tree in the background, even two people sharing a few slabs of raw fish seems like a holiday get-together. 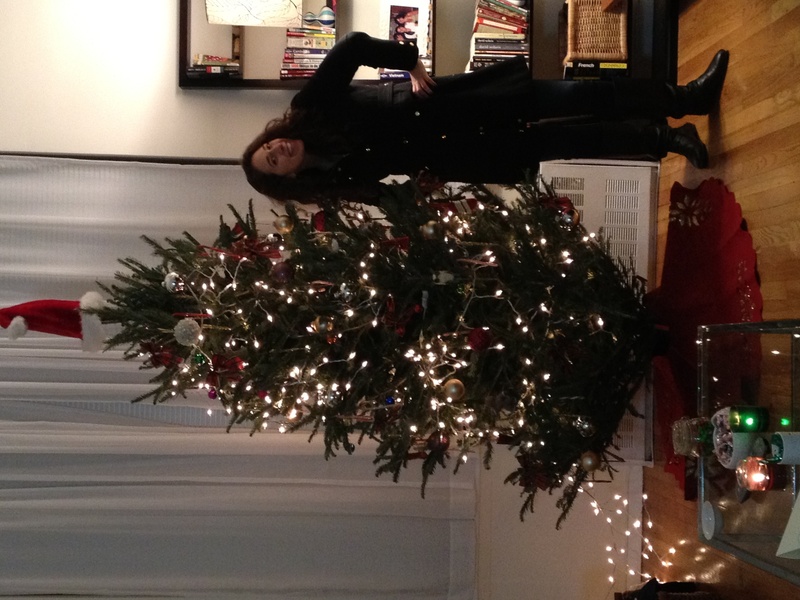 We were singing along to the Glee Christmas album, dreaming of Christmas (and Hanukkah) presents, and Elena was feeling so jolly she made me take pictures of her standing alone next to the tree. Maybe it was the smell of the tree (or the smell of the pine-tree-scented candle I lit), but by the time we finished dinner we were feeling so lighthearted that we decided to have dessert. I don’t mean some frozen grapes and a shot of limoncello, the kind of dessert you may assume people who write a blog called SkinnyOffice would eat. We’re talking real dessert: a bag of week-old cookies, a few handfuls of red and green M&Ms, some Hershey’s kisses, and some very stale Almond Joy Pieces (why are all my desserts old?). Overcome by the holiday spirit, we didn’t want to leave any seasonal treat uneaten, but the only thing left to eat in my apartment was Andes Chocolate Mints. 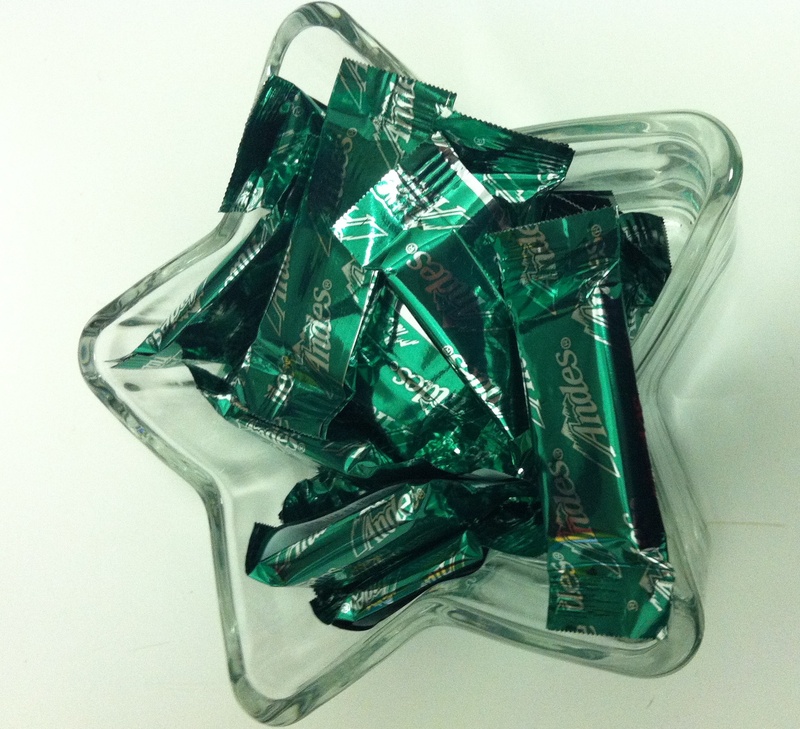 I insisted that Andes mints are not a holiday candy– mints are ALWAYS in season, right? Elena disagreed. Since I was in a particularly generous mood last night, I gave in and we indulged in one last treat. But it turns out it was not an indulgence at all! Andes Chocolate mints only have 25 calories EACH! I’ve already filled my jacket pockets with Andes mints. God forbid I’m on the subway (or anywhere) without a snack…now I can just pull a chocolate mint out of my pocket, and 25 calories later, I’m satisfied! I don’t know about you, but I have already began celebrating my favorite holiday of the year (yes, even more than the sacred day of my birth); Thanksgiving. I have always been a sucker for desserts and I will, to this day, lose control for anything apple…. 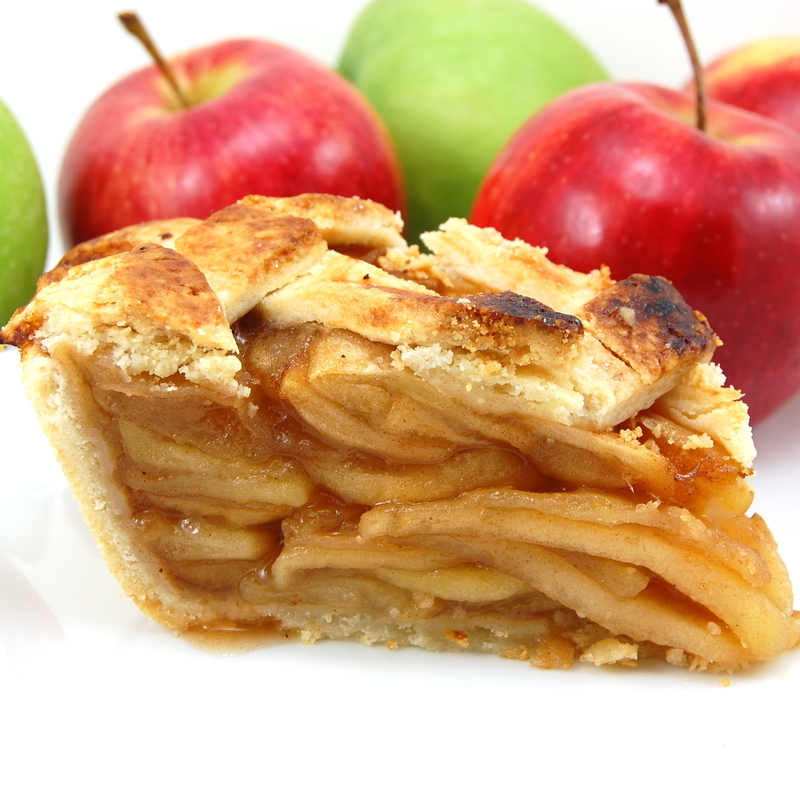 apple pie, apple cider, honey crisp apples, apple pie gum, apple tortes, apple dumplings, caramel/ candy apples, apple streudel, apple butter, and most of all apple crisp… all of which are quite plentiful this time of year. I know what you’re thinking…. betch needs to get on a #diet. Well, you could imagine my delight when I opened up the cabinet on one fine November afternoon (looking for something post-lunch to satisfy my sugar craving) when I found Popcorn, Indiana’s Apple Crisp Popcorn. At first glance, I thought I would have some major working out do to after consuming one bite of these crunchy caramel covered morsels, but after scanning the Nutrition Facts to see what kind of damage I was doing, I soon found that this would be MY Thanksgiving Miracle. You are probably most familiar with Popcorn, Indiana’s White Cheddar flavor from the bag that your college roommate used to hide under her pillow munching away at after a night of drinking. If you think that is good, well, this limited edition flavor is so much better. 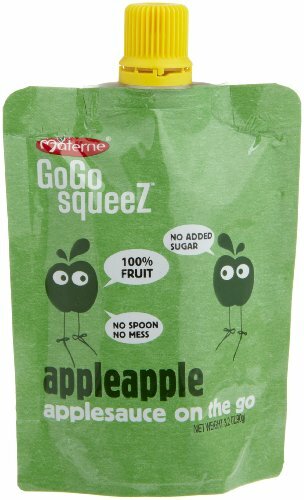 With only 110 calories per serving (serving size is a just casual 1.5 cups), this is my version of apple crack. 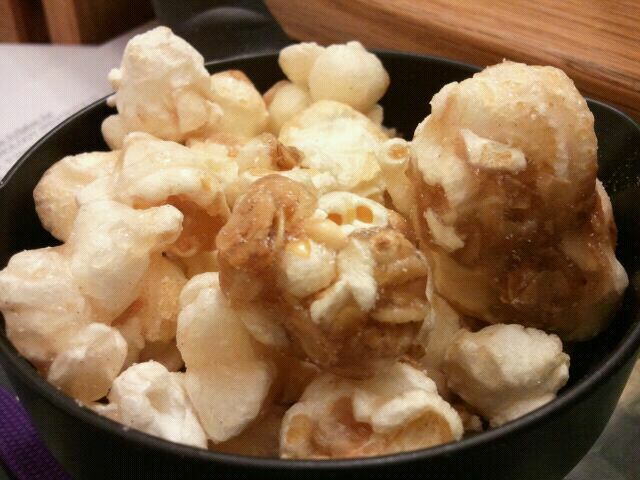 These giant globs of caramel and oat covered popcorn will get your fingers a little sticky, but when you are sitting on gchat thinking about how you are so over this job, the trip to the bathroom to wash off those paws with be well worth it. Samantha in her Christmas dress. Her hair looked so much better in person. Given my penchant for exclusivity, it’s not surprising that I begin feeling particularly merry at my first sight of the Starbucks holiday cups. Though I’m not a regular Starbucks goer, the moment I see people holding the red holiday cups I race to my nearest Starbucks so that I too can be spotted on the streets of NYC with a limited edition cup. 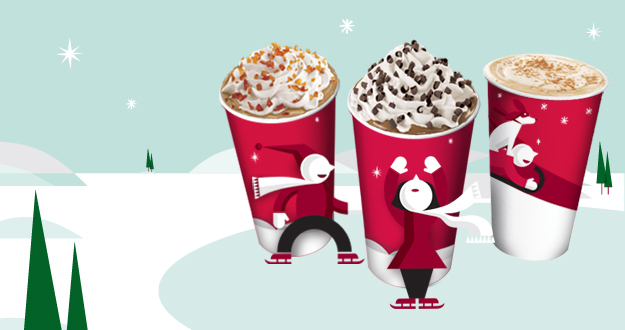 Starbucks also has a line of holiday-inspired drinks: peppermint mocha, gingerbread latte, even a SKINNY peppermint mocha. But a mocha is a mocha, and even in skinny form it’s not skinny enough for SkinnyOffice. Luckily, Starbucks has an option that’s SkinnyOffice-friendly: Joy tea. Joy tea has zero calories and is only available during the winter months, making this the ultimate Skinny Snack. Although it was in the 60’s in New York yesterday, Joy tea is also perfect to drink in the office in the cold weather, especially when your co-workers refuse to turn on the heat (ok, I’m always the one who refuses to turn on the heat…#sorryimnotsorry). Joy tea tastes like the holidays– like as if the Rockettes were doing the kick-line in your mouth (in a good way). At least I think it does. Every time I drink it I’m so overwhelmed by the jolly holiday cup and by the fact that it actually is the holiday season that everything seems to taste like sugar and spice and everything nice. I better go stock up on Joy tea while it’s available. 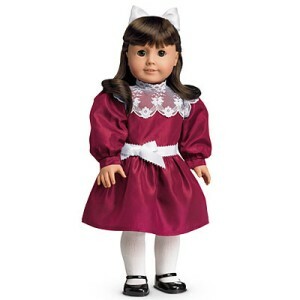 I lost my Samantha doll a few years ago and I still rue the day I didn’t purchase a backup. Happy Holidays, on behalf of Starbucks! I love Thanksgiving. 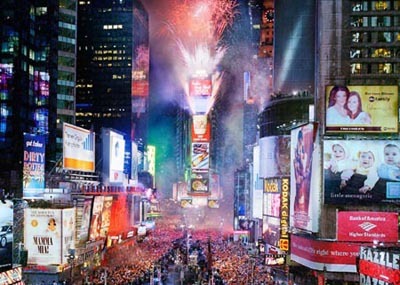 I love it so much that I’m writing about it today, a full 20 days before November 24th, 2011. I even know that there are exactly 20 days until Thanksgiving because I downloaded a Thanksgiving Countdown Widget. I’m amazed that the entire American population does not share my gleeful anticipation for The Greatest Holiday of All Time, but my fellow countrymen do have other things on their minds. Thanks, Kim Kardashian, for distracting the nation with the devastations of your love life. The problem with loving Thanksgiving so much is that for the entire month of November, all I want to eat is turkey, stuffing, mashed potatoes, and apple pie, and having the robust appetite that I do, my cravings always present me with the most dire dilemma of my year: do I indulge all 23 days leading up to the big event (and probably gain a few pounds in the process), or do I deprive myself of all Thanksgiving food until the last Thursday in November, when I inevitably will overeat to make up for all I’ve missed? It’s a Catch-22 that I wrestle with every fall, but this year it all comes to an end. This is 2011: the year of the Thanksgiving Miracle. In the spirit of giving and sharing and whatever else the holiday season stands for, I’m going to share this miracle with you. As we all learned from the legendary Rugrats Hanukkah special, miracles come in many forms, and this miracle happens to come in the form of Apple Pie flavored chewing gum. 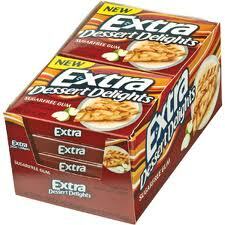 Made by Wrigley’s, Extra Dessert Delights Apple Pie gum is literally a savior for Thanksgiving-aholics like me. The gum comes in a seasonally appropriate cranberry-colored pack, and includes a very generous 15 pieces! Each piece is tucked inside a silver wrapper that glitters like tinsel, and when you open it the scent of freshly ground cinnamon dances in the air. The big moment, when you actually bite into the gum, is even better than one could imagine. This actually tastes like apple pie. If it didn’t get hard and lose flavor after about 7 minutes, it would be delicious enough to replace the real thing (for the 364 days of the year that I don’t allow myself to eat real pie, of course.) With Apple Pie gum, it can be Thanksgiving every day! But the Thanksgiving Miracle of 2011 doesn’t end there! Extra Dessert Delights comes in five other flavors: Key Lime Pie, Mint Chocolate Chip, Strawberry Shortcake and Orange Creme Pop. The Mint Chocolate Chip is creamy and totally worth the 5 calories per stick; the Key Lime Pie is so shockingly tart that it scared me out of trying any of the other flavors. Despite the horror that is Key Lime Pie gum, this Thanksgiving I am thankful for the people at Wrigely’s, for creating a gum that allows me to have my pie and eat it too! Okay, I know what you’re all thinking: Almond Joys– no matter what size they are– are NOT a diet snack. And to be honest, you’re right. But in the spirit of Halloween, I’ve decided to blog about an actual candy today; a candy that contains not only calories and fat, but real sugar, too. This is a once-in-a-lifetime post, so pay attention. 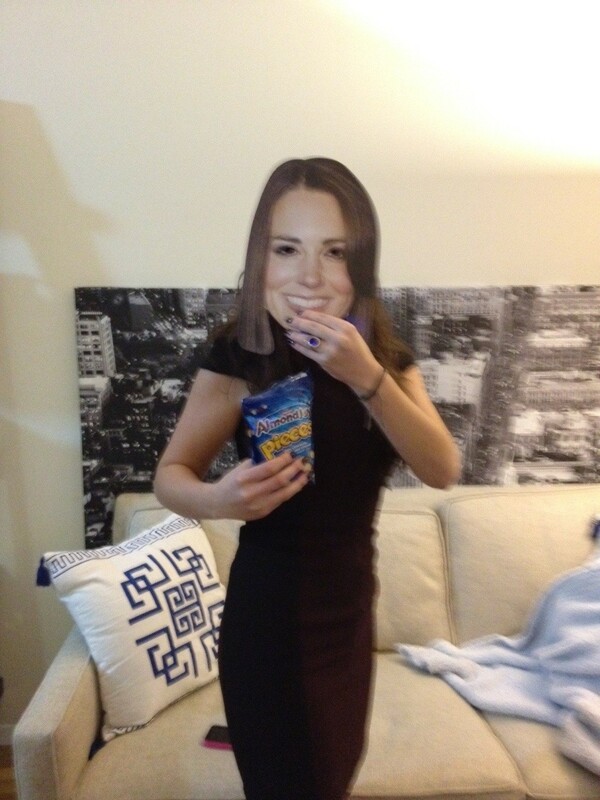 ....as if Kate Middleton would EVER eat Almond Joys. But it's a good costume! Everyone deserves a little treat on Halloween, and it only took me 20 minutes of scrutinizing every item in the candy aisle at Duane Reade until I came across Almond Joy Pieces— my Halloween treat. Almond Joy Pieces are M&M-size candies that taste like mini Almond Joys. I actually find them more delicious than original Almond Joys, and I’m not saying that just because admitting to loving any King Size candy would make me seem like a gluttonous hog, which I’m not (though I am often mistaken for one when I’m at the toppings bar at 16 Handles…) Each piece tastes as if it contains sweet coconut shavings, creamy milk chocolate and real almond slivers. I know it’s unlikely that every one of these candy coated gems has all that goodness inside its shell, but strange things do happen around this time of year. 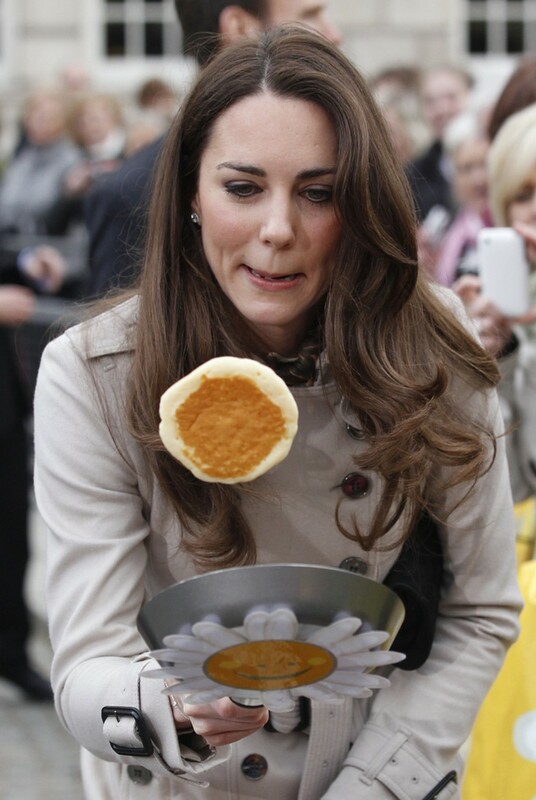 But she does eat pancakes?? Princesses get away with everything. On top of being so good it’s spooky, there are just 200 calories in every 47 pieces. I don’t usually like to blog about anything even slightly caloric, and to save myself from a lifetime of shame I won’t even mention the fat content, but I’m letting loose for the holiday and suggest you do too! 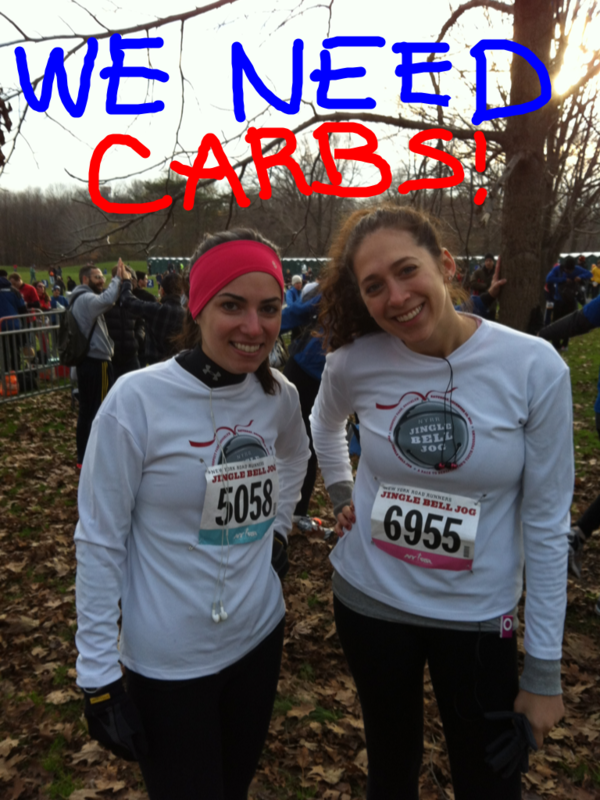 Back to carrots and diet coke tomorrow…WAH.